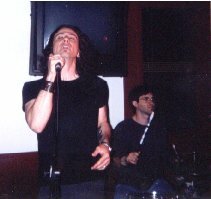 The Badlees are a band from central Pa. 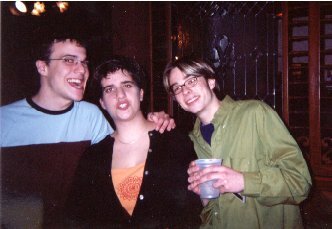 They have been around for a long time doing the local music scene, and even the whole MTV thing for a little while. Their music is a wonderful mixture of everything! Check out their site and listen to some samples of their music. 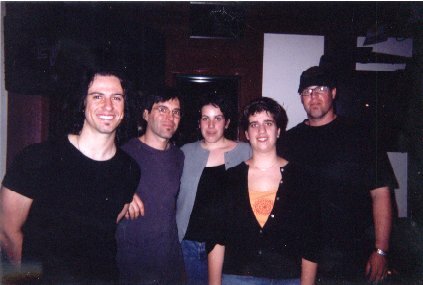 Truthfully, I don't remember the first time I saw the Badlees perform. My family and I have been seeing them for yefars now. 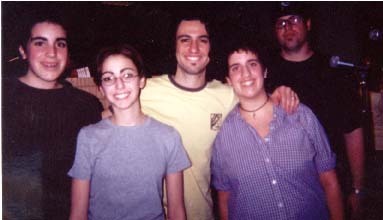 We started listenig to them after discovering that they had a song titled "Gwendolyn" (which is my name). 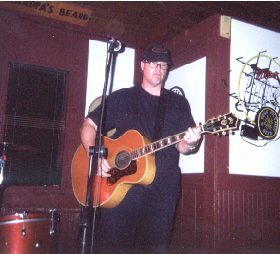 After that, we started going to shows and really got into the music. Below are some pictures from a few shows. 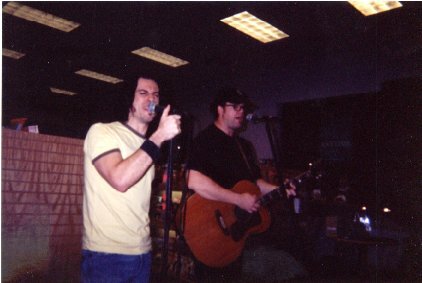 This is a picture of Pete Palladino (singing) and Jeff Feltenberger (guitar) playing at Borders Books and Music in Camp Hill, Pa sometime in the winter of 2000/2001. 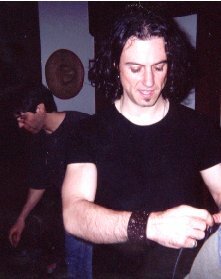 This is a picture of Pete Palladino, the lead singer of the Badlees. 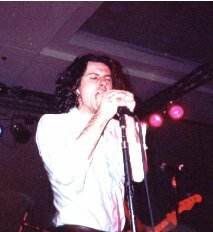 It was taken at the Harrisburg Hilton Hotel on Saturday, Feb. 17, 2001 at the Millennium Music Conference. From left to right-me (Gwen), Emily, Pete, Logan (my sister), and Jeff. This picture was also taken at the Borders show. This is a picture of Brett Alexander. He plays guitar and many other string instruments, and he sings too. 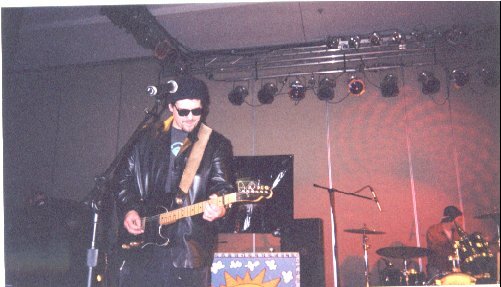 This picture was taken at the Harrisburg Hilton on Feb. 17. On Cinco de Mayo 2001 Logan and I decided that we would get out for once without Mommy. 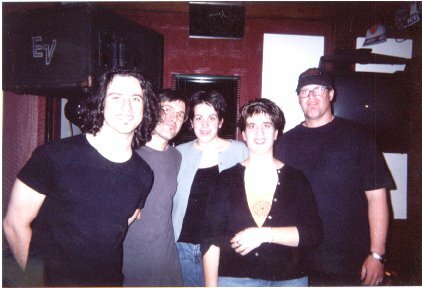 Her friend Joe took us over to Ground Round in Camp Hill to see Pete, Jeff, and Ron of the Badlees. Sure enough, Mommy decided that she was being left out on the fun, and we decided that it just wasn't the same without her there, so she drove over too. The show was great! We had so much fun celebrating Cinco de Mayo. 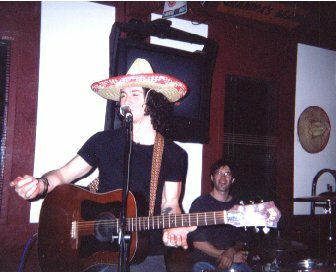 Pete decided to try to say everything so it had something to do with Mexico or sounded Spanish. Then, he was dancing and flailing himself around like he normally does, and hit his head on the TV. It was hillarious to watch, but I'em sure it wasn't too funny for him...from what we gathered from the lyrics in the song he was singing("OW! OW! That really hurt!! I cant feel my toes 'cus I'm bleeding from my head!!!) I think it may have hurt a little. Check out some pictures from the show below.